﻿ Park Hyatt Busan (South Korea) | FROM $205 - SAVE ON AGODA! "Staffs were very friendly and helpful." 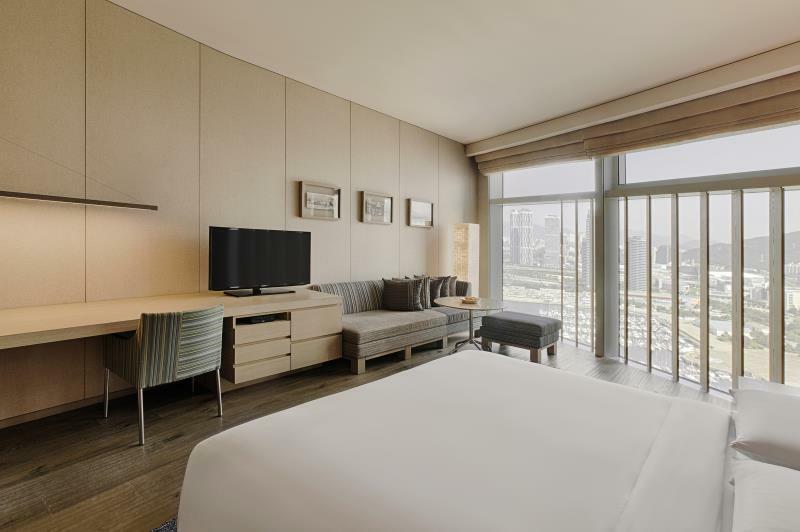 Have a question for Park Hyatt Busan? "I come to celebrate our anniversary and my son birthday, everything is so amazing, all staff also very kind and friendly." "Room interior design is amazing overlooking the bridge." "Very spacious and comfortable bed." 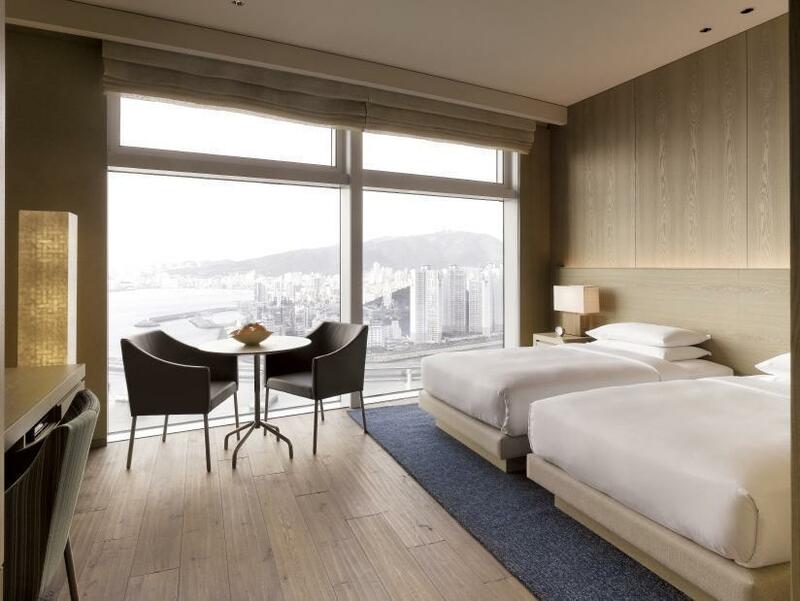 Ideal for fun and relaxation, Park Hyatt Busan is located in the Haeundae-gu area of Busan. Only 27km away, this 5-star hotel can be easily accessed from the airport. With its convenient location, the hotel offers easy access to the city's must-see destinations. 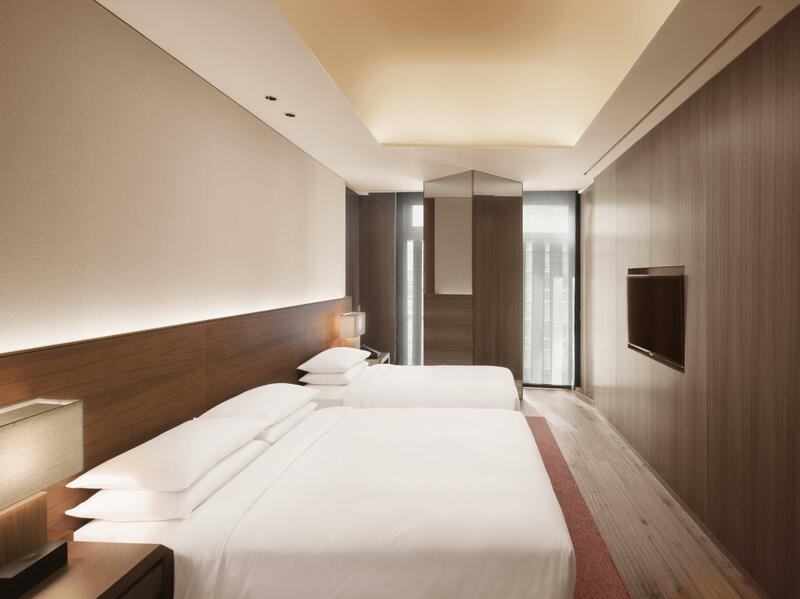 First-rate hotel services and facilities that define the Hyatt Hotels experience await you at the Park Hyatt Busan. Top features of the hotel include 24-hour room service, free Wi-Fi in all rooms, daily housekeeping, taxi service, ticket service. 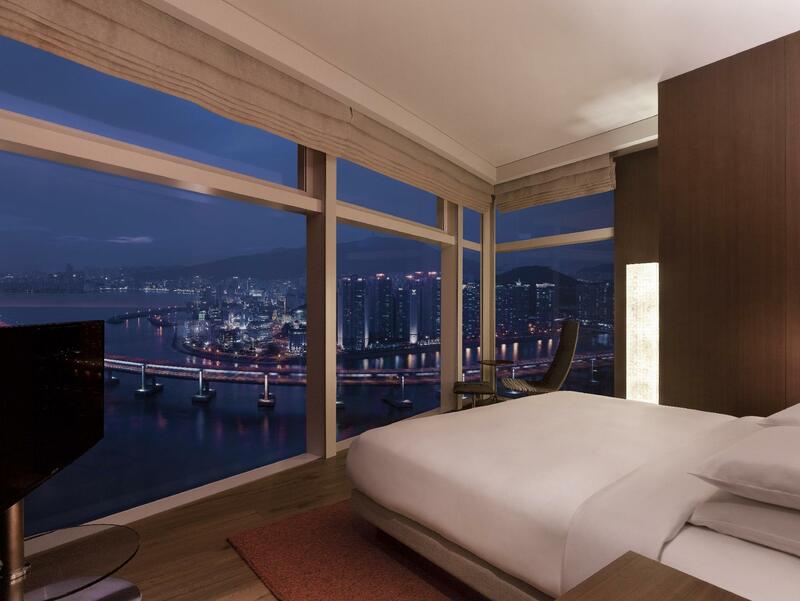 The ambiance of Park Hyatt Busan is reflected in every guestroom. television LCD/plasma screen, complimentary tea, dressing room, mirror, scale are just some of the facilities that can be found throughout the property. The hotel offers an excellent variety of recreational facilities, including hot tub, fitness center, sauna, indoor pool, spa. 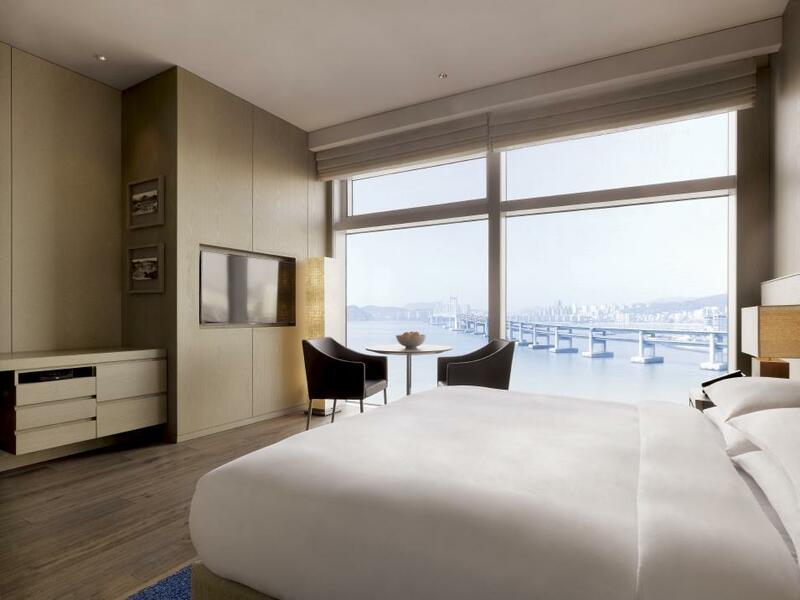 Enjoy unparalleled services and a truly prestigious address at the Park Hyatt Busan. "Best place and best looking spot to view ocean in Korea"
Please note that luggage and transfer service for guests are offered at Busan Station. For more detail about time and extra charges, please contact hotel directly. Luggage delivery service to and from the property and Busan Station is available on weekend and public holidays. Guests are required to contact Concierge Desk. Breakfast is only available at the dining room. Bookings inclusive of breakfast cannot substitute it with room service. The sauna will be closed for annual maintenance on February 12, 2019; April 9, 2019; June 11, 2019; October 15, 2019; and December 10, 2019. The weather was very cold when we arrived at 6pm after taking one hour airport bus. We appreciate that two staffs ran to us and help take our luggages during the cold weather outside. The checkin process was quick. However, a room with wooden blocks at Windows was assigned to us. They told us that it was due to the safety issue. During the night, the washroom water tubes were very noisy. We asked for another room for our remaining three nights. A room at Higher floor with no wooden blocks was assigned. It made me confused why no blocks at higher floor. The staffs would ask us whether taxi was required when we are leaving the main lobby every morning. Two staffs , Even the female staff would take our bulky luggage into the taxi. Their services was impressive. It would be better if they provide a map with restaurant location nearby to the hotel guests. We found that there were many restaurants inside several locate malls after exploring on our own. Room interior design is amazing overlooking the bridge. Very spacious and comfortable bed. Staffs were attentive and helpful. Sauna not free for in-house guests which is a negative point. Quite a distance walking to Haeundae Beach from the hotel. OPS bakery is just nearby if you want to grab breakfast. overal a great hotel, I enjoyed the swimming pool as well. However, there was no place to take a proper shower and only a small change room that fits 1-2 people at a time. Overall, nice rooms and good service though. Slightly pricey I think, but probably the best hotel in the area. It was 2nd stay for me with my family and it was great as before. If you consider the location right infront of ocean, park hyatt is not the one but ocean view is amazing and food is good too. I will come visit again when I come to Busan with family. My family and I thoroughly enjoyed this stay - so much so that we extended our stay and took fewer days in Seoul. Concierge were attentive, and genuinely interested to help make your stay enjoyable and hassle free. The hotel is in walking distance to 3 supermarkets and there iis a 7/11 next door. In close proximity are several casual and fine dining restaurants - a great steakhouse, Kraze burger, Chinese, Italian, Vietnamese... and a great bbq restaurant. The hotel is also near the hop-on/hop-off bus and a short taxi ride to the huge shopping malls and expo. My favorite feature is the hotel bicycle and of course the vista view of Busan and the Gw Bridge that is stunning at night. Hyyundae beach is immaculate and the kids loved it - a very quick taxi ride. You are really not far from anything - it's 20 minutes to Busan city and its seafood market and excellent street shopping. We'll definitely be back. 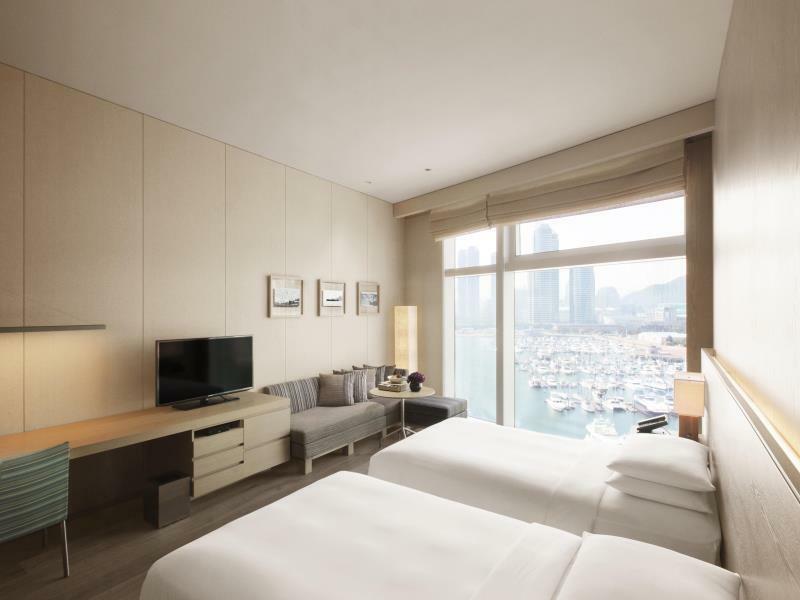 We didn't expect Park Hyatt Busan to have such amazing views of the Marina, or for the rooms to be so nice. We booked the basic rooms and even those were great. Almost everything in the room was controlled using the touch panels by the bed, the separate shower and bath tub were perfect too. Good pressure in the shower, and the bath tub also faced a TV if you wanted to watch something while you soak. Everything was new and well maintained, the staff were attentive and friendly, and the Marina views every morning were lovely. The massage at the spa was good too. The hotel is near several cafes, restaurants and bars, all facing the marina. It's a lovely area for an evening stroll. Since this hotel opend just a year or so ago, it maintains a very clean condition everywhere. The sea view room we stayed in offers a really great view of the ocean, bridge, and all kinds of boats. The restuarant on the top floor offered delicious foods at reasonalbe price and the swimming pool was also relly nice. The only con for us was the location. It is situated in residential area so it was calm and quiet but not walking distance away from the popular local restaurants and cafes. 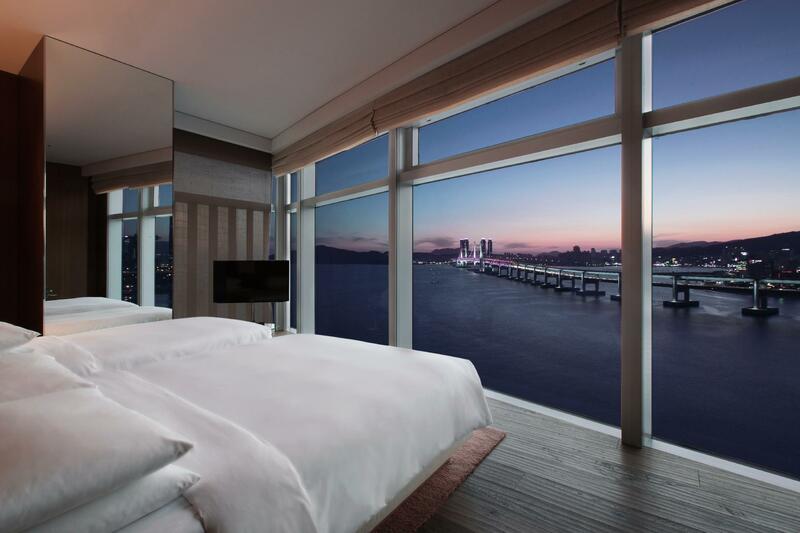 I was satisfied with this new luxurious five star hotel at Busan which facing yacht habour. the room design was very nice specially the bath is very good. just one negative point was totally non-smoking in the hotel which was rather tough for the smoker. Beautiful modern design, attentive and helpful staff and nice location to the beach. 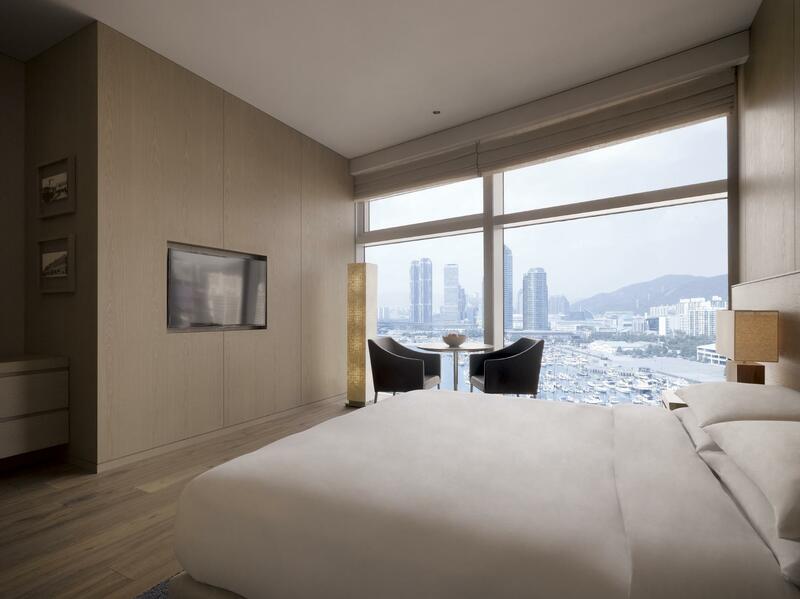 Park Hyatt Busan is a newly built modern hotel which is located near to Hyundae beach. 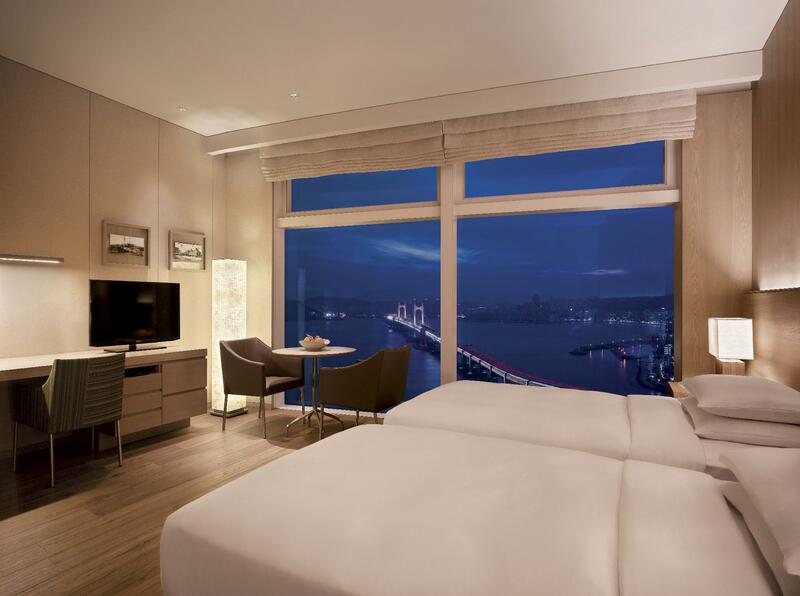 Some rooms offer breathtaking night view of the bridge and others offer view of the yachts park on the bay. The staffs go all out to satisfy all enquiries and know well the local cuisine and restaurants. Taxis are always around the front of the entrance and the staffs can negotiate prices with the driver on behalf of the inhouse guest. Nice location which is near to the restaurants, cafes and convenient shops. I highly recommend this hotel!! Best pasta and french fries avail at the dining room. (opens until 10:30PM) Breakfast buffet was pretty overpriced. amazing everything!!!!! but a little bit far from metro!! View was incredible. And the standard of service by workers was good. But I'm not sure of the quality of the morning buffet and lunch in the restaurant. I travel all over the world and I have to say the view was amazing. Staffs were very friendly and helpful. Overall the location and the layout of the hotel was 10. The room is clean and nice. But one thing really disappointed me was TV. It is not a smart TV that could connect with samsung phone, iPhone or iPad. I never had any concern with other hotels I booked before. The price was too high for the presidential suite but amenities are not met. I would suggest new modern TV should be replaced. The lighting should be brighter for makeup room. The light seems so dark, I barely could see my makeup. The Park Hyatt was exactly what I needed after a day of sightseeing and, as a non-speaker of Korean, retreat to unwind and relax. A sincere thank you to Mr. Din, the thoughtful concierge who's gracious assistance from finding me a place to play tennis to a last minute tour guide made all the difference in the world. Last, the rooms are perfect and housekeeping does a very nice job each day keeping things fresh. We stayed two nights in a room on the 17th floor with unbelievably good view of the bridge, the harbor and at nighg yhe city lights. The room and whole hotel have a very pleasant design with many well thought out details. Staff speaks very good english and has been trying to be really helpful J would definetely go back if there is a chance.